No Googles or errors on a Thursday! Did not know CHAR, GAINER, ORBITZ, EOS. 9:50, but left a square blank, d’oh! Forgot to point out yesterday that my “to a degree” pretty much fits with what you said. I’d say “a couple of them” were harder than anything in the LAT, barring the “tricks” that don’t show up there. But overall for the puzzles we’ve posted, the ACPT puzzles aren’t all that different in difficulty. Thanks, Glenn … I think we’re on the same page. For a little over a year, I’ve been recording my results for all of the crossword puzzles I do and I’ve idly thought of doing some statistical analysis of them (once I get my Fortran environment working again!). An odd thing I’ve noticed is that my times for early-week Newsday puzzles are essentially always smaller than my times for early-week LAT puzzles, even though, subjectively, they often “feel” pretty much the same as I do them. I have speculated that the clues for the LAT puzzles simply take longer to read, but I’m not at all sure of that. I also note that I seldom finish a David Steinberg Universal puzzle in less than nine minutes. That’s partly due to the way they’re printed in my paper (too small and slightly blurry), but there’s something else going on with them. 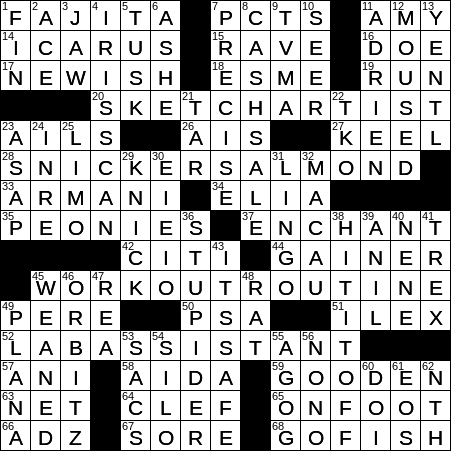 Lots of factors influence one’s performance on crossword puzzles. But I digress … and, dang it, I’m still working on getting ready for my upcoming trip. Hopefully, I’ll be ready the morning we leave … 😜. There’s lots of statements I could make like that of my own observations in doing these things. Like with the early-week Newsday, I would say Mon-Tue are easier than the Monday LAT. Odd thing for me is the late week Newsday seems tougher (witness the roughly 4 minute difference). My guess is the language that gets used more than any of the answers being strange, which is a universal problem for me. I could say the language is probably what threw me off on the two ACPT grids I didn’t finish. FWIW, I finished out the other two grids, unaided. One I finished out within 2 minutes (highlighting my other big “problem” solving these, given the amount of time I took within “regulation” trying to figure that corner out), the other I had so messed up in the process of double-checking things I took a more sizable amount of time. So I’d say I really only got beat by one puzzle out of the whole set. Still not respectable, but I’m okay with it. All that said, really the only statistic I want to see is one that indicates that I’m improving. Hopefully that will continue to be the case. Fairly easy Thursday but some inky crossouts before completion. Initially spelled Adrien with an “a” and Macau with a final “o” Not sure how “revealed the function of” is “moused over” you have to then “point and click”. I use Kayak for travel plans and still got fooled trying to think of an alternative water craft. A “seer” is a person not an object. It’s the Lady reading the crystal ball or the cards who is the seer not the objects. At least IMHO. Peonies are also our city flower. Utica NY. They are everywhere in season. Ants and all..
Geese honking their way back to Central New York. A few crocuses (croci?) opening. On my iMac, in many apps, moving the cursor over a button causes an explanatory box to pop up, telling me what that button is for. Maybe it’s an Apple thing? Also, I’ve recently had some cause to be a bit peeved with Travelocity. In your opinion, is Kayak (which I had never heard of) a better tool? Unfortunately Orbitz,Travelocity, Expedia, etc offer almost identical deals. Kayak is a kind of clearing House that lets you look over these and other sites at once in case there happens to be a a variation and possible attractive deal. fun to try, I keep telling myself. Seriously, it is our daily most fun activity. Kudos to all you guys and gals. 8:56. I got the theme, but I didn’t GO FISHing for them after the fact. I just looked at Bill’s bold faced letters and saw them. I’ve used both Orbitz and Kayak. You’ll generally get about the same pricing on both of them. I still prefer to make reservations with the hotels directly. If you do that, you can call the hotel and negotiate date changes, plan cancellations etc. If you go through an Orbitz or Kayak or Hotels dot com , you pretty much pay at the time you reserve and are stuck with your reservation. My plans change too often to do that. Dave – the same thing happens on Windows based systems. When you MOUSE over an icon, it usually says what it does or is. Where are you vacationing this time? I hope it’s another area where you “accidentally” buy an expensive bottle of tequila…. I’ve always had a yen to see Quasimodo’s bell tower and maybe some of Victor Hugo’s favorite hangouts … and I thought I might buy a bottle of 200-year-old cognac, but then I discovered that they don’t sell it in 1ml sizes (let alone the fraction thereof that my budget might allow … 😜). 12 mins 42 sec, and 6 errors. What a mess. Pretty trick Thursday for me; took about an 45 minutes with no errors. Did this while recovering from dental work and having gotten up way too early. Also, didn’t know or never heard of TVMA, AMY, ADRIEN, SNICKERS ALMOND or Kayak. And, PCTS, SEER and MOUSED seemed pretty suspect. That “revealed the function of” clue was gnarly! Makes sense once I got it — as is usually the case.